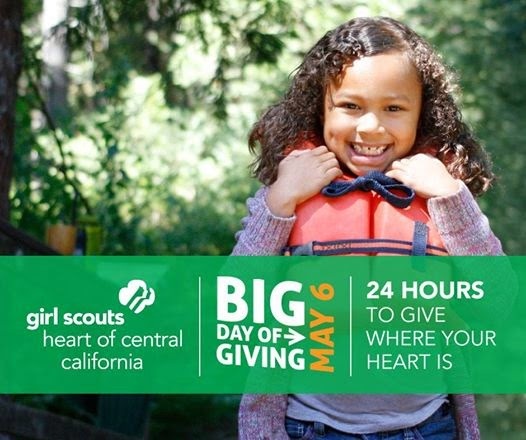 On May 6 we are trying something NEW: Girl Scouts Heart of Central California is participating in an online crowdfunding campaign for Sacramento Region called the BIG Day of Giving (#givebigdog), which aims to inspire and unite the community in supporting hundreds of local nonprofits (nearly 400!). For 24 hours, you will have the opportunity to give where your heart is. Starting at midnight on Tuesday, May 6, 2014, online donations to GSHCC will be accepted through this link: http://givelocalnow.org/girlscouts. One of the best parts? There’s an incentive to BOOST all donations! Thanks to awesome community foundations and businesses, every donation will receive a prorated match from a pool of matching funds. Our #givebigdog goal is to receive 102 individual donations on May 6—a donation for each of the 102 years that Girl Scouts has been building girls of courage, confidence and character, who make the world a better place. Please consider making a donation to GSHCC. Programs for girls receive only 6% of philanthropic dollars in the U.S. By donating to GSHCC—the premier leadership development organization for girls—you’re helping to empower girls to develop their full potential… which in return will help create a brighter future for all of us. And with the matching incentive, your donation will go even further on May 6. Thank you for your continued support of Girl Scouts! For more information on #givebigdog, visit givelocalnow.org or email funddev@girlscoutshcc.org.